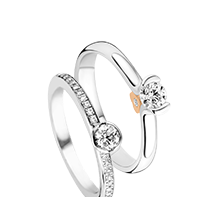 With a ring from the Pre Wedding Ringcollection she will definitely say YES ! Our compact collection offers you unusual styles, from simply straightforward to a hint of the orient. Do you want classy with a special accent? Just like your love, every model is unique and specially custom-made. 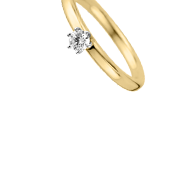 At Pre Wedding Ringcollection you will find not only sober and discrete engagement rings, but also lavish models. Choose the weight of the diamond and the colour of the gold yourself. 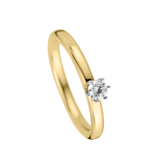 The size of the stone largely determines the value of the ring. The shiny white brilliant has an exceptionally pure and high quality. It is always hand-set. This way we guarantee your stone being properly held forever. 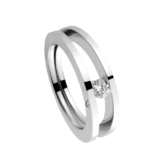 Certain models are designed in such a way so that they can be worn next to the wedding ring on one hand. 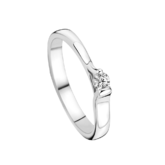 A personal engraving such as the date on which you ask her to marry you, completes your proposal. 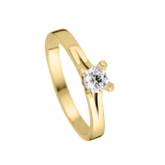 Look at and feel the rings at your jeweller. Why choose a VdB&VR ring? Guaranteed to be a pleasure to wear for years. VdB&VR offers an incredible choice. Ranging from classical, traditional style to hand-made and trendy designs. Do you choose gold, or are you the platinum, palladium, high-quality steel, Black Steel, titanium or silver type? Brilliant or zirkonium? 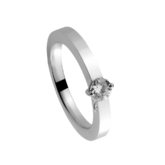 Are you on a tight budget or are you looking for an exclusive ring? VdB&VR always guarantees outstanding quality through combining innovative production methods and traditional craftsmanship. 100% made in Belgium and a real lifelong wearing pleasure. Subscribe here and we'll keep you posted!